Zucca, a butternut squash ravioli at Alessa by Chef Pirozzi and Salerno by Chef Pirozzi. 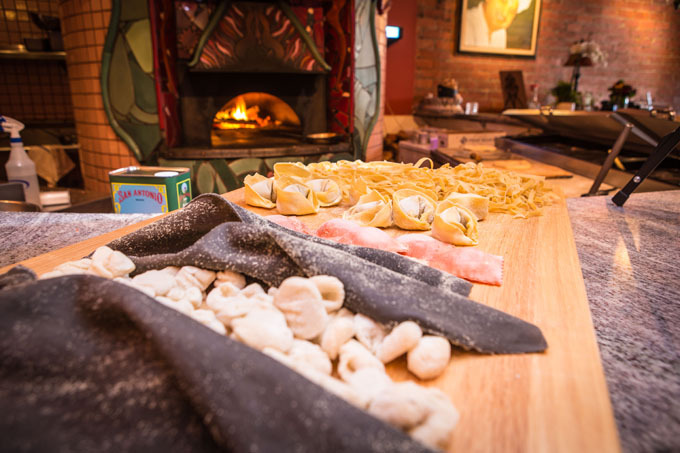 Local chefs showcase fresh pasta with authentic flavors reminiscent of their vibrant Italian culture. No matter the time of year, or even day, nothing is quite as satisfying as a steaming plate of fresh pasta. 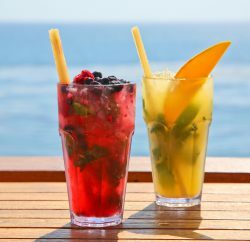 Laguna Beach chefs with connections to both Italian culture and cuisine are putting their own twists on traditional dishes, melding their heritage with their own personalities and cooking styles. There are Italian restaurants all over town, and all of the authentic places still make most of their pasta in-house, giving their food a special touch that emits a homey feeling. From seafood pasta at Ristorante Rumari and fluffy gnocchi at Romeo Cucina to multicolored noodles at Taverna Laguna Beach or the unique raviolis at both Alessa by Chef Pirozzi and Salerno by Chef Pirozzi, there’s something for everyone’s taste. And when all of your choices are homemade, it’s almost impossible to go wrong. All of the Italian chefs in Laguna Beach have two things in common: their love for Italian cuisine and for their home country. After growing up in Italy and learning about the restaurant industry in their own ways, each of these chefs aimed to bring their authentic recipes to America, and that’s just what they did, eventually forging a path to Laguna. Another talented chef, Francesco Schintu, aids the entire Taverna brand from Dallas, where the chain’s corporate headquarters is located. Originally from the island of Sardinia, Schintu grew up surrounded by Italian cuisine, which led him to begin his culinary career, including his studies at Boscolo Etoile Academy in Tuscania. Over the years, Schintu worked in many kitchens, but there was one where he met a kind old woman who taught him her techniques for making traditional pasta. Today, he has taken those methods and modified them in order to develop his own homemade pasta recipe. On the Italian mainland is Calabria, where Antonio Romeo, executive chef and owner of Romeo Cucina, grew up and first became involved in the restaurant industry because his parents ran an eatery in his hometown for 45 years. Romeo and his parents are not the only chefs in the family, as his four brothers and two sisters all followed the same career path. 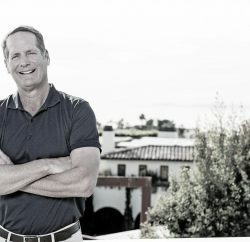 “We moved here about 30 years ago … and, basically, we tried to bring our recipes and new way to cook in California,” Romeo says. As far as professional schooling, Romeo studied culinary arts in his home country for five years and subsequently earned his degree after working under various renowned Italian chefs. Romeo isn’t the only chef in town who was greatly influenced by family. Another example is Alessandro Pirozzi, executive chef and owner of both Alessa and Salerno, who grew up in Naples with his three sisters. 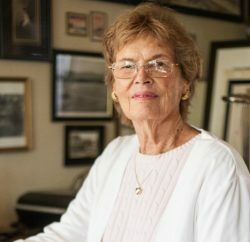 Being the only boy made squabbling with his siblings almost inevitable, so Pirozzi would escape to the kitchen, where his grandmother taught him everything he knows about the culinary arts. The pasta-making process at Lumberyard, one of the non-Italian eateries that makes pasta in Launa Beach. As any of these chefs will tell you, when it comes to making pasta dough, the ingredients make a big difference in both taste and texture. Crivello opts for durum flour because it has more starch, which helps maintain a thick consistency. He mixes the flour with either eggs, to give the dough a bit of elasticity, or water, which he says is a good substitute for diners with allergies or for those watching their caloric intake. Romeo also uses durum flour, but chooses to blend with a semolina flour; both of which are imported from Italy. “We just got new flours from … [Naples, from a] factory that is about 500 years old, so it’s an extra exquisite touch on … the pasta,” Romeo says. He also uses fresh eggs in the mixture and makes his pasta almost every day, only keeping it for a maximum of two days before making a new batch. Schintu also likes to use a blend of flours, as well as egg yolks, a bit of olive oil and a small amount of salt to make his pasta dough. He recommends utilizing a KitchenAid mixer to get your dough to the right consistency. He also notes that the amount of time spent mixing the ingredients can affect the elasticity of the dough, and suggests mixing for no more than five minutes. 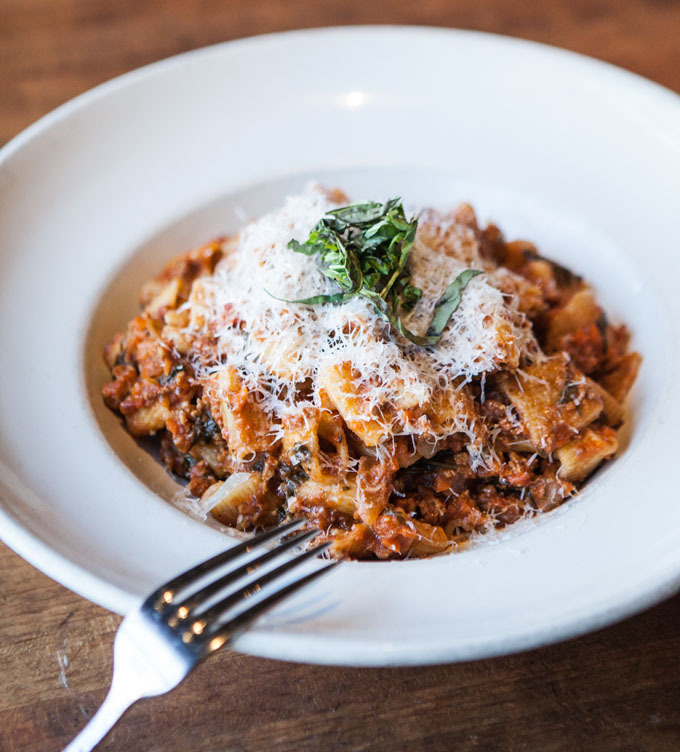 Taverna Laguna Beach’s garganelli pomodoro features quill pasta and Bolognese or fresh tomato and basil sauce. The type of machinery or tools used to form the pasta depends on the shape that the chef aims to achieve. For example, if the goal is to create a round pasta like rigatoni or penne, it is necessary to use a special machine that will cut the dough into that particular form. Meanwhile, flatter noodles like spaghetti or fettuccine can be handmade by simply rolling out the dough and slicing it to the desired thickness. If you’re thinking of making pasta at home, Crivello says the trick to perfect pasta is as easy as using the right amount of each ingredient. So, you first need to gather the basics: 1 pound of high-quality flour, 8 ounces of water and a roller as well as a bit of salt. Of course, you can choose to add other ingredients such as eggs, olive oil or sugar, depending on your taste. Then, you simply mix the ingredients together until it has a doughy consistency. If opting to make the pasta by hand, you must roll it out until it is extremely flat and then cut into pieces, otherwise, run the dough through a pasta-making machine. “You just have to be very specific when you make your dough [to ensure] that it won’t stick or it’s too dry,” Crivello says, noting that too much water can actually cause the dough to lose its moisture. 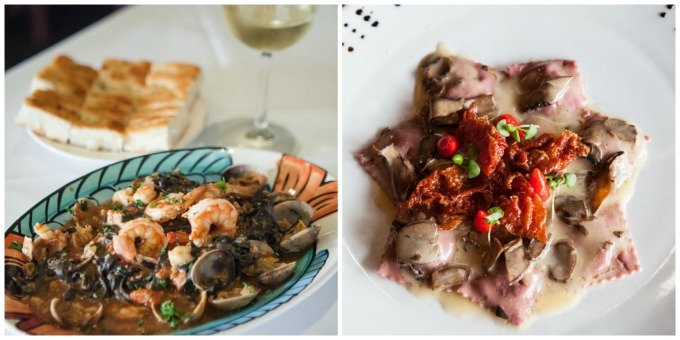 Left: Black linguine with seafood at Ristorante Rumari; right: Hard to Catch Ravioli at Salerno by Chef Pirozzi. Of course, Laguna’s Italian eateries specialize in perfectly made pasta—and some rather unique ones. The Linguine Nere del Mare al Cartoccio at Ristorante Rumari is a black seafood linguine that gets its dark hue from a natural ingredient: squid ink. “Once we have … [dyed the pasta], we saute all the clams and shrimp in a tomato sauce with a little bit of brandy and, once we combine those together, we bake it in the oven at about 550 F for 10 to 15 minutes,” Crivello explains. “When you bake pasta, the pasta will absorb all the flavor from the sauce, so it’s creamier [and has] a lot more flavor.” Crivello praises this finished dish for its buttery flavor, which is especially prominent in the thick and creamy tomato sauce. Other standout dishes at Ristorante Rumari include the lobster ravioli, which is served in a cream sauce with chopped tiger shrimp and saffron; the pappardelle puttanesca with tomato sauce, anchovies, garlic, capers and olives; and the Spaghetti Malanese with cauliflower, pine nuts, raisins and breadcrumbs for a lighter bite. Romeo Cucina also offers a popular lobster ravioli dish, which is made by hand and stuffed with lobster meat as well as some crab, and the Tortelloni di Carne, which is filled with house-ground, wood oven-braised rib-eye and vegetables, and served with a creamy pesto sauce. For a colorful dish with a retro feel, order the Paglia e Fieno at Taverna. “It comes from the ’50s and ’60s—it was very trendy at that time—so that was the inspiration to bring this recipe to the menu,” Schintu says of the dish, which consists of two types of noodles, half yellow egg pasta and half green spinach pasta, which gives the plate a multicolor finish. Schintu explains that the Paglia e Fieno is made with shallots and olive oil, then assorted mushrooms are added along with some roasted chicken and cream. “[We] make a nice sauce and then we serve the pasta with shaved Parmesan on top, and then the truffle [oil for] flavor,” he adds. Though this dish is typically served with chicken and a cream sauce, Schintu says diners can customize when it comes to the protein and sauce. 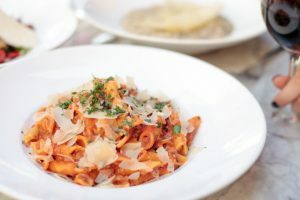 Other popular dishes at Taverna include the garganelli pomodoro, which comprises quill pasta with a choice of a fresh tomato and basil sauce or a Bolognese sauce with shaved Parmesan. For seafood lovers, try the tagliolini scampi, which mixes garlic, tomatoes and shrimp with white wine, lemon capers and butter sauce. Chefs at Romeo Cucina make pasta almost every day so that each dish contains fresh flavors. At Alessa and Salerno, Pirozzi prides himself on making fresh pasta every day using top notch ingredients. 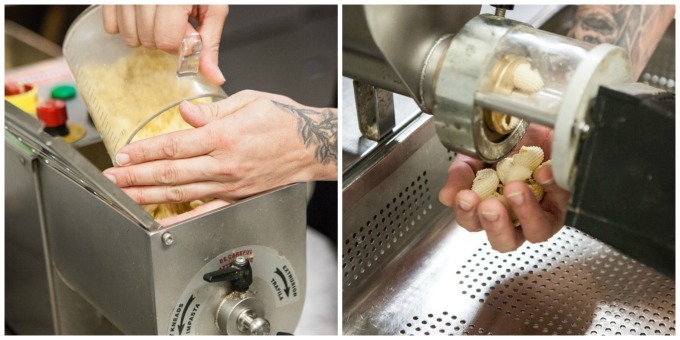 “[Pasta] is very healthy when you use good, fresh, organic ingredients,” Pirozzi says. One standout dish at both of his eateries is the Healthy Salmon Pasta, which features a lemon-infused taglierini pasta with fresh salmon, garlic and shallots in a pinot grigio-based sauce. Pirozzi invented this dish with his uncle, and said both men enjoyed its contrast of flavors as well as its balance of acidity. 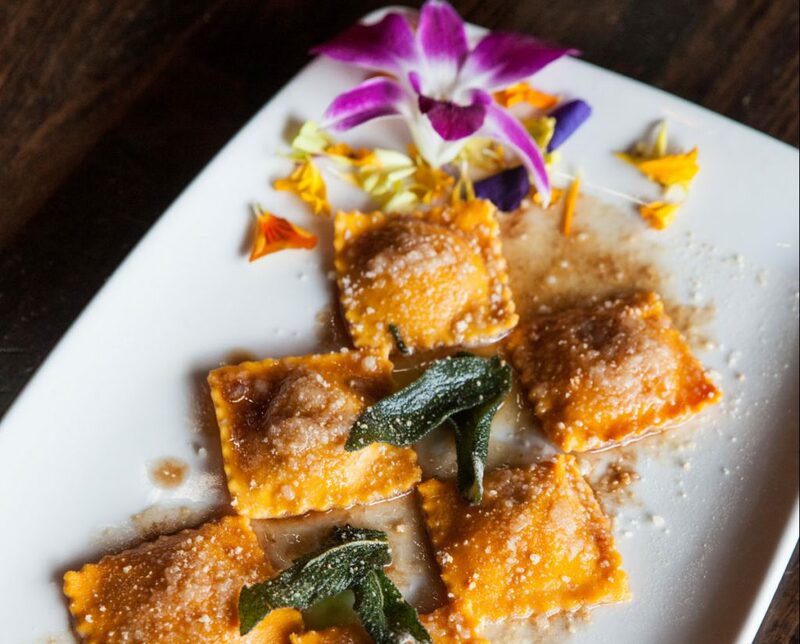 Another popular dish, also at both restaurants, is the Zucca, an organic butternut squash ravioli made from an amaretto liqueur-infused dough, filled with ricotta and drowned in a brown butter-sage sauce. And, solely at Salerno, is the Hard to Catch Ravioli, which uses wine-infused pasta that has a fun purple hue, fresh roasted rabbit (a popular meat in Italy), crispy San Daniele prosciutto, teardrop pepper and topped with a Reggiano sauce. Another eatery in town, Ti Amo by Il Barone, also serves homemade pasta as part of its unique culinary lineup, such as the tortellini filled with imported cheese and accented with a mascarpone, walnut and poached pear cream sauce. If you’re more of a meat lover, there is a tortelloni dish that’s instead filled with roasted veal and beef and served with a Bolognese sauce. For another rich flavor profile, turn to the cavatelli with mushrooms, pork sausage, black truffles, red wine, as well as ricotta and Grana Padano cheeses. No matter which restaurant you choose to visit for your next pasta meal, get ready for delicious homemade dishes that will make you feel like you’ve been transported to Italy, and will certainly keep you coming back for more. Lumberyard’s rigatoni Bolognese with pork and veal. Italian eateries aren’t the only places to enjoy fresh pasta in Laguna Beach, as these local restaurants have their own take on this homemade meal. 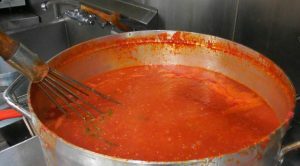 Vince Crivello, owner and executive chef of Ristorante Rumari, shares his recipe for a simple yet impactful marinara sauce. First, hand-squeeze the tomatoes and set aside in a bowl. Finely chop the onions and garlic on a cutting board. Add the olive oil to a medium-sized skillet on medium-high heat to warm the oil for 1 or 2 minutes. Reduce your burner to medium heat and add the onions, saute for 3 to 4 minutes and then add in the garlic, stirring both until they are a light golden color. Immediately add the hand-crushed tomatoes and salt gently. Next, add a few twists of freshly ground pepper, reducing to a simmer just after it comes to a low boil. Add some of the chopped basil and then turn off the burner to stir in the remaining basil. Serve fresh, and leftovers can be stored in the freezer for up to three months.